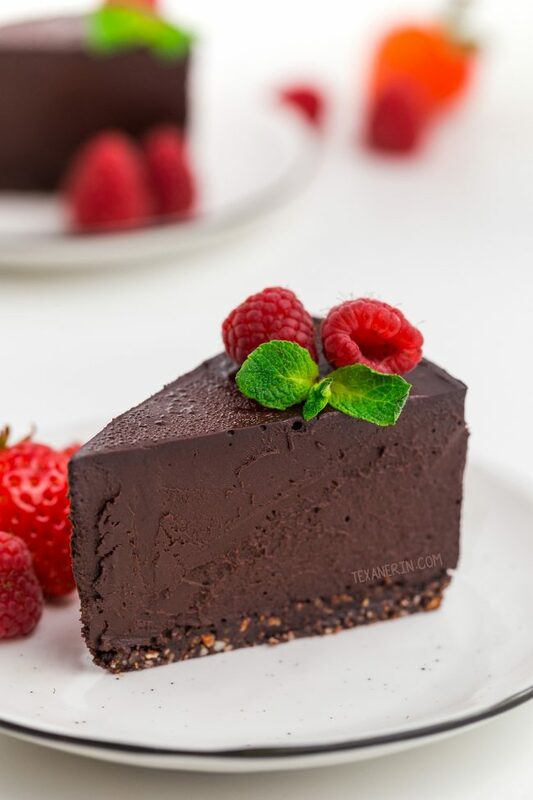 This paleo cheesecake is also vegan and super rich, creamy and decadent! Made with coconut milk, dates and coconut sugar, this no-bake cheesecake is a little healthier than a traditional one. You all doing anything special for Valentine’s Day? 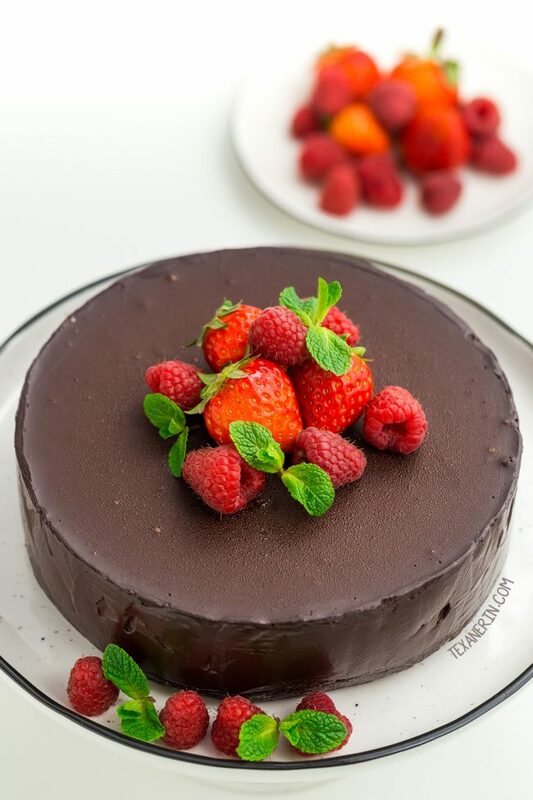 We never do (although I don’t have anything against the holiday) but I do take it as the perfect excuse to make something rich and chocolaty like this vegan chocolate cheesecake! These gluten-free chocolate lava cakes and raspberry molten lava cakes (which are also gluten-free) are our favorite Valentine’s Day treats. I love that they yield just two! Perfect for portion control. But back to today’s recipe! So many paleo cheesecake recipes use a 6″ or 7″ springform pan and I’ve always thought that this was so silly. How many people have a 7″ springform pan? Every traditional cheesecake recipe I’ve ever made calls for a 9″. So I tried making this paleo cheesecake recipe in a 9″ pan. And the layer of cheesecake was like 1″ thick. It didn’t look impressive enough to get anyone’s attention. I thought about doubling the filling but the recipe already calls for 3 cans of coconut milk and I couldn’t see anyone making a recipe that called for 6 cans of coconut milk. So here it is in a 7″ springform! It’s super rich. We served it in 1″ slices and that was enough. So while the cheesecake looks quite small, it will provide much enjoyment. :) It freezes great so you can enjoy it a little at a time! Cashew-based vegan desserts like these paleo lemon bars, raspberry cream pies and paleo key lime pie really taste like the real thing. But I’ve had SO many bad vegan cheesecakes that use cashews or tofu in place of cream cheese. I’m not saying that they’re bad in general – perhaps I’ve just not had the right recipes! I just usually really miss the cream cheese in dairy-free cheesecakes. This vegan cheesecake, though, won’t leave you disappointed. The filling is nut-free and uses coconut cream and dates, which results in a texture that’s creamier than regular cheesecake. And does it taste like coconut? Not at all! 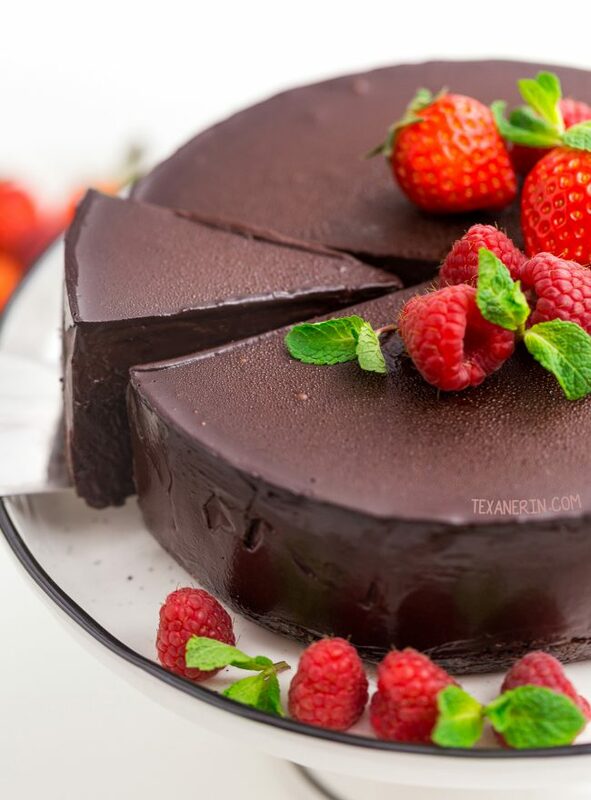 This paleo cheesecake is all chocolaty goodness. I used unrefined coconut oil and even with that and the 3 cans of coconut milk, there’s not a bit of coconut taste (at least with the coconut milk I used!). I tried out a load of crust recipes. I keep trying to recreate a paleo Oreo-like crust (like this classic Oreo crust from Crazy for Crust) and it just seems impossible. I’ve tried other paleo chocolate cookie crust recipes I’ve found online and none of them are even remotely like an Oreo crust. I desperately want it to taste like the real thing! So I went a different route and ended up with something super simple and no-bake. 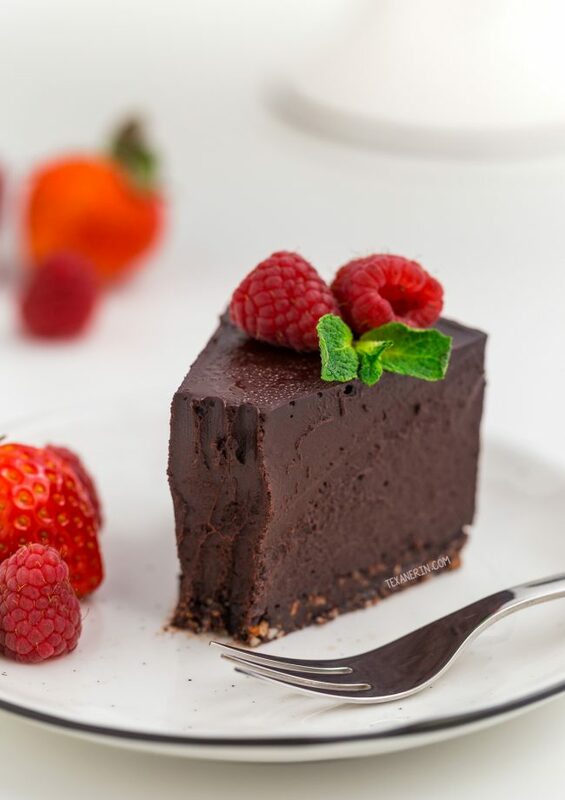 Which also means this vegan cheesecake is no-bake and raw! For more no-bake treats, check out this post on 85 no-bake paleo desserts (most of which are also vegan!). What can I use in place of the coconut cream? Nothing unfortunately! There’s no sub for it. Can I use something instead of coconut sugar? Granulated sugar would work if you don’t care about it being paleo. A liquid sweetener would make the cheesecake too runny. You could probably add a bunch of coconut oil to firm it up but I think that’d require a lot of experimenting to find the right amount. 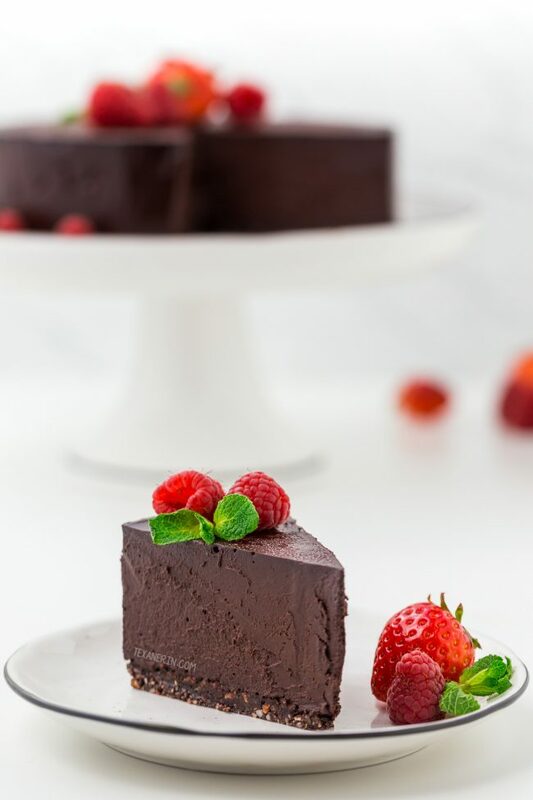 And as always, I have no idea how to make this paleo chocolate cheesecake low-carb (I say this in every post because someone asks this in every recipe). Can I use something instead of dates? I haven’t tried it but perhaps prunes would work. I’m not sure how different they taste but I think with all that cocoa powder, it’d cover up any unusual taste. Can I use a different sized pan? I don’t have a food processor or high-speed blender. What else can I use? Sorry to say you need one of those. You can’t chop up the dates finely enough. And I really, really recommend a high-speed blender (not a regular blender!) over the food processor. They’ll get the filling perfectly smooth and creamy. I can’t say that all food processors will do the same (though I’m sure some would!). I first tried this cheesecake with Dutch-process cocoa powder (it’s my favorite!) and it made the cheesecake have a very odd bitter taste to me. My husband didn’t taste the bitterness. I tried the next day and it still tasted very bitter. The third day, though? Totally normal. I wasn’t sick and nothing else tasted off to me so I have no idea what that was about. I’m pretty sure it had to be the cocoa powder. So because of this, I’m recommending that you not use Dutch-process cocoa powder and use the regular natural kind (like Hershey’s unsweetened) instead. Raw cacao powder also works. Line the bottom and sides (all the way to the top) of a circular 7"x3" springform pan (if a little smaller, you can pour the leftover filling in a small dessert glass / bowl) with a piece of foil. In the bowl of your food processor using an S-blade, pulse all the crust ingredients until it starts to come together. Depending on your food processor, this will take 1-3 minutes. Pinch a bit of it together - it should stick together easily. You can also use a high-speed blender to make the crust but you have to scape the sides of the container often. I thought it was much easier with a food processor. Press firmly onto the bottom of the lined pan. Get out a high-speed blender and make sure it's large enough to fit all the ingredients. The filling yields about 5-6 cups. If your blender isn't big enough, a food processor will do - but it'll likely (it depends on your food processor) be creamier with a high-speed blender. Add all the filling ingredients, in the order listed, and blend for about 30-60 seconds, or even longer, depending on your blender, or until totally smooth and no lumps of dates remain. Pour the filling over the crust and place the cheesecake in the freezer for 6-8 hours or until the filling is frozen. Remove the cheesecake from the freezer and remove the foil from around the sides. If it's difficult to do now, wait until it thaws a bit more. Let thaw for about 1 hour at room temperature (it'll depend on the room temperature and how long the cheesecake was frozen) and top with berries. Can be stored in the fridge for a softer consistency. You can use 3 cups of canned coconut cream or get three 14-ounce (400-gram) cans of full-fat canned coconut milk, chill them overnight, then scoop out the coconut cream that has formed at the top. You should get 3 cups (720 grams) of coconut cream. Warm it up slightly so that the mixture will be easier to blend. 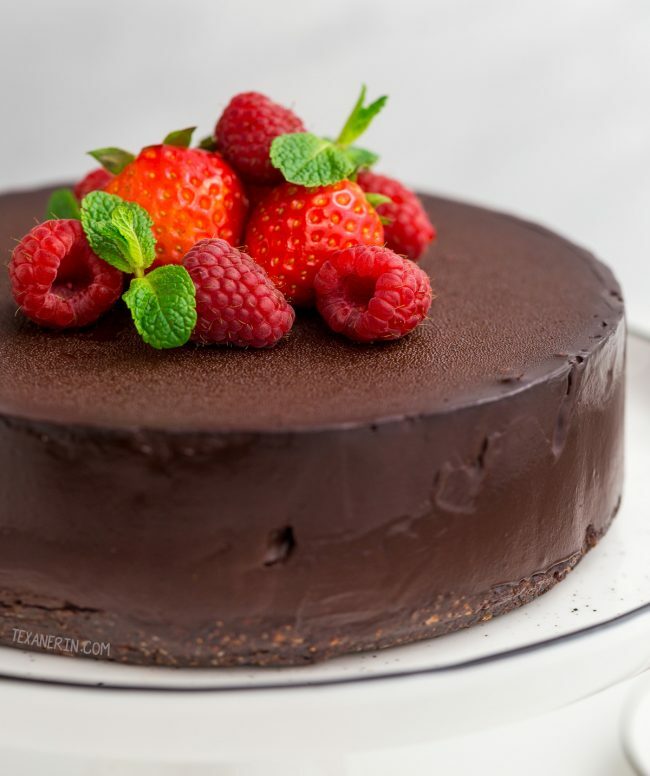 88 comments on “Paleo Chocolate Cheesecake (vegan, no-bake)” — Add one! Hi Erin, looking forward to making this for Easter dinner, we have several in our family with dairy allergies. I was wondering, can refined coconut oil be used in place of unrefined, and would you use the same amount? And if you replace regular white sugar for coconut sugar, is it a one to one ratio? Thanks! I made this yesterday and it was a gloppy mess. Didn’t freeze up and was all runny. 1. should I have chilled the cans of coconut cream? 2. I poured the entire can into the pot to warm up. Should I have just used the cream off the top and not any of the coconut water? It sounds like you used coconut milk and not coconut cream. If you used coconut milk, please read the note at the bottom of the recipe! Can I use parchment paper instead of foil?? Is there a reason for lining the pan with foil? You could try it but I didn’t because I thought it’d be too difficult and messy. Parchment doesn’t conform to the bottom and sides as well as foil. I like your recipe, I was wondering why do you need to add sugar if you are already using dates? Wouldn’t it be too sweet? Hello! I added sugar because it wasn’t sweet enough (in my and my taste testers’ opinions) with just the dates. Hello, I am gonna do the cake tomorrow. I was just wandering if I can use honey, maple or coconut sirup instead of coconut sugar? And if not, is the sugar gonna melt for sure? Thank you. I’m sorry for just now seeing your question! What browser are you using? Do you see the Print button in the recipe box? If it doesn’t work for some reason, you could copy and paste the recipe into a text document and print that. You think I can substitute coconut cream with dairy cream? Sorry for just now seeing your question! Chilled coconut cream is very firm and dairy cream is liquid so it won’t work. The cheesecake wouldn’t set up properly. Sorry about that! This looks like just what I need for a delicious Valentine’s Day menu! Best dessert ever! I’ve noe made it twice and only now seeing that I don’t have to get the coconut milk but that I can get the cream instead, d’oh’ oh well. Now I’ve got tons of the milk leftover haha! Anyway thanks a bunch! Made it originally for my girls book club and now for my mommas bday. lasts a while even for us sweet tooth’s! Hehe! Can’t wait to make the brownies I saw on here as well, yum! Yay! I’m happy to hear that you liked it that much! I just added a note to the recipe to make it clearer with the coconut cream / milk thing. Sorry that you’re stuck with so much coconut water now. If anyone gets some tummy issues, you could use it to make some homemade natural Gatorade-like electrolyte drink. :D Haha. Thanks for your feedback! Holy fudge this looks amazing! I’ve never seen such a dense and chocolaty cheesecake, and I love that it uses just fruit and coconut sugar for sweetness! Hi, is there a reason you used the cream off coconut milk instead of straight coconut cream ? Would a can of coconut cream work ? I’m so happy that it came out well! I hope that your boyfriend enjoyed it and that he had a great birthday. :) I wonder if the type of cocoa powder could be the reason why you found it so sweet. The recipe uses just enough sweetener for me and I don’t think I have an immense sweet tooth. Although I’m much more of a milk chocolate girl and don’t like dark chocolate! You used unsweetened, right? Thanks for your feedback! I tried making this and partially did succeed with a 13” pan but I didn’t read the recipe right so instead of chilling the coconut milk and taking the cream from it, I just filled it in. It was still awesome, hence why I alone ate half :P, but insanely sweet for my folks. Now I would like to make it again with experience so I would like to do it right this time, but I have a question about it then. Instead of chilling the milk and scooping for the cream, can I just buy the already made coconut cream? Hi! I’m happy that you enjoyed it and that it came out well with the added coconut water in there. :) And yes – it’ll definitely work if you just use coconut cream! Thanks a bunch for your comment. Hello, I have a question about the type of cocoa powder you used. Can we talk via email? Hi! I used a German brand of Dutch-process cocoa powder so I don’t know if it’s relevant for you (unless you live in Germany!). This looks divine! Can’t wait to try it out myself! Thank you for offering this recipe! I made this for my husband to celebrate his second father’s day and he loved it! I would call it an ice cream cake rather than a cheesecake ;) it will be my go to healthy ice cream from now on! I only used 1/2 the coconut sugar recommended and it was still sweet and delicious. Thank you for this recipe. I have a question. Can I substitute honey for the dates in the filling and if so how much honey should I use? Hi Erin, looks amazing. Do u k if I could use maple syrup in place of dates for filling. Wow! This pie is divine! I substituted half of the coconut sugar for dark chocolate chips and it is amazingly delicious. We decorated it with strawberries, pumpkin seeds, bananas and goji berries. How long do you think the pie will keep in the fridge rather than the freezer? It’s so rich that it will take us a while to finish…. You’re welcome! I’m so happy that you enjoyed it. :) Your decoration ideas sound great! I’ll have to try that. I think it’d be fine in the fridge for about 4 days. You can always cut it into pieces and then freeze if you think it’ll take a while to finish. Thanks for your comment! This is so good! 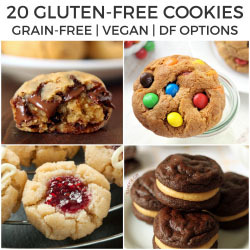 Everyone loves it, and can’t believe it’s dairy free, and grain free. You’re welcome! I’m happy to hear that it was enjoyed by everyone. :) Thanks a bunch for your comment! Wow. This is the best vegan dessert I have had. The texture is amazingly creamy. It makes me wonder why all other vegan cheesecake recipes call for combinations of coconut cream, cashews, vegan cream cheese, and tofu – all you need is the coconut cream! Also, I only put in half the cocoa powder and sugar and put in chocolate chips to fill the rest and the flavor came out to be really rich. I’m happy that your chocolate chips sub worked! If you ever try it as written, I’d love to hear how the two versions compare. :) And best vegan dessert ever?! Woohoo. That made my day. :) Thanks so much for your comment! Does this actually taste like cheesecake? It’s creamier and richer than cheesecake. Beautiful and clear photos on this post! It looks delicious. This is the best cheese cake I have ever tasted. As my son-in-law said it is better than Cheesecake Factory cheese cake. Wow! That’s amazing. You’ve made my day! Thanks a bunch for your comment. I’m thrilled you and your family liked it so much! Hi I made this today flavor great. Just too soft, next time I’ll add more coconut oil to firm it up a little more. Hi! So happy you liked it. :) Thanks for your comment! what can i substitute for coconut sugar? My daughter is allergic to dairy and sugar – do you think stevia would work in place of coconut sugar? I did read your substitute section but it didnt mention stevia, and I don’t want to mess up this recipe- do you consider stevia a granulated sugar? I appreciate your advice. This cheesecake is absolutely delicious! Quick and easy to make. I’m allergic to cashews, is there something else that I can substitute for them? There aren’t any cashews in this recipe. I’m have a food sensitivity to almonds. Do you think I could use cashews in place of the almonds in the crust? Most definitely! That wouldn’t be a problem at all. I’d love to hear how it goes! This looks so perfect for my chocolate cravings! Enjoying my favorite without all the guilt! Can’t wait to give this a try! Always a fan of chocolate and cheesecake. Thanks for sharing this! I made this today for a Valentines Day dessert. This recipe is absolutely delicious. I didn’t have a springform pan, but used parchment paper in a 6 in cake pan, and it came out perfectly. I also subbed out cacao because that’s what I had on hand. But the texture and taste was perfect. I will definitely file this under a ‘go-to’ recipe. Yay! So happy that it’s a new go-to recipe for you. :) And wow – a 6″ cake pan?! How high are the sides? My 6″ cake pan would have been way too small for all the filling! I’m thrilled that it worked out well for you. Thanks for the tip on the pan size (because I know lots of people don’t have 7″ springforms) and for your comment! Since I don’t have the 7-inch springform pan, I’m thinking about putting them into individual cupcake liners. What are your thoughts on how many it would make and if you have any concerns whether they would turn out differently? TIA. Sorry for just now seeing your comment! I have to confess that I’m worthless when it comes to estimates like this. The filling yields about 5-6 cups (that I did measure!). So you can see how big your cupcake liners are (I believe they’re usually 1/3 or 1/2 cup) and figure out the yield from that. :) I’m guessing 12 but I could be wrong. And you might need to do 1.5x the crust, but I’m not sure. I’d love to hear how they come out if you give it a try! Yes, please!! This cake is absolutely stunning! Perfect for Valentine’s Day! This chocolate cheesecake calling my name! I need this right now! This cheesecake looks stunning! My kid doesn’t like cheesecake, but loves everything chocolate. I think he will this one, the chocolate version! This looks like heaven!! I’d love a slice or two! This cheesecake is one of the best no bake one’s I’ve seen! Native Forest has fabulous canned coconut cream, so I know longer have to chill coconut milk to get the cream. I have a couple of cans in the pantry, so this recipe is now in the line-up! Thanks for the tip! That sounds convenient. Wish we had them were I live! Hope you’ll enjoy the cheesecake. I’d love to hear how it comes out! hUGE, I love it for that!!! I hope I didn’t tempt you with this recipe! And I hope you’ll enjoy the cheesecake once you get the chance to try it out. :) And yay on having the right sized pan! I always used to wonder what in the world I was going to make with that tiny little pan. Now I know! This will be fantastic for valentines day! So beautiful – can’t wait to try it. WOW!! This looks rich! Creamy looking though. This sounds great. My kids can’t have dairy and one is allergic to nuts. I like the idea of the coconut cream. Trader Joe’s sells cans of straight up coconut cream. I might try that. Also, to make this low carb, you would have to remove the dates and you said the dates add to the creaminess of the cheesecake. But if someone did want to make it low carb, they could try removing the dates and replacing the sugar with a combination of xylitol and erythritol…like half and half. I made a peanut butter cheesecake the other day with straight xylitol as my sweetener….not as good as sugar but better for me. Beautiful cheesecake! Thanks for the recipe. Coconut cream is harder to get here and I live outside the city so I just go with my favorite brand of coconut milk. I so wish we had Trader Joe’s here! 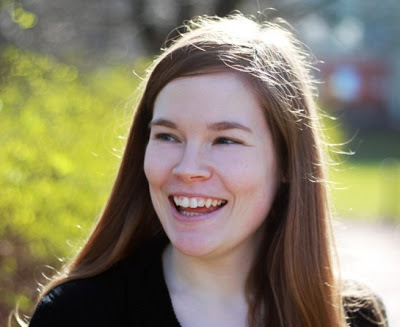 Thanks for the info on how to make it low-carb. It’s great that I have commenters who can leave tips like this because it’s all a mystery to me. The low-carb sweeteners I’ve tried all have such strong aftertastes and I just can’t get used to them. And the texture doesn’t come out right, either. :/ Thanks for your comment! This looks wonderful!!! No eggs, yaaay for me!!! I have made a chocolate cookie crust from Deliciously Organic that was super yum! Can’t remember if it was paleo, but it was certainly grain-free.